Entry 241 – Linda Trice – on Kenya’s Art, Kenya’s Word – AND Are Agents Necessary? 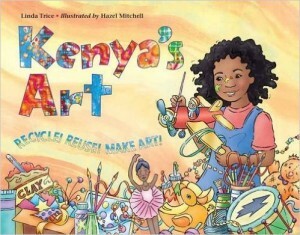 JAN: Your new picture book for ages 4-8, Kenya’s Art (Charlesbridge Publishing) is now available from all booksellers as of Tuesday, January 12, 2016. It’s such a heart-warming story. The daddy in the story helps his daughter Kenya find something wonderful to do during spring vacation. When school begins again Kenya inspires her multicultural classmates and her teacher, Mrs. Garcia to use recycled materials to make art. Some readers may remember their grandparents’ tales about making quilts and toys from recycled materials. This is your third book in the Kenya series and joins Kenya’s Word and Kenya’s Song. What inspired you to write Kenya’s Art? LINDA: Two things inspired me. FIRST GRADE STUDENTS: I taught a group or remarkable students in a New York City public school. Their parents were involved, supportive and helpful. I asked my students to tell their classmates about their spring vacations. Cecile went to the Bahamas, showed us some of the shells she collected and told us about each one. Brian told us about each of the three books he’d read, Diane showed us her science project and Imani read her one page report about Martin Luther King. 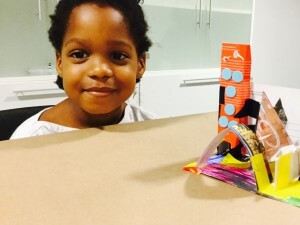 Five Year old Bryce Simmons & her finished art project. JAN: What were your favorite childhood books? LINDA: There weren’t stories that I could relate to when I was a child. The books I read had rural and suburban white children in them. When Black people were included in a story, which was rare, they were often offensively portrayed. The result of this was that in elementary school, when I started writing stories, I wrote about white people who lived in the suburbs in homes with, believe it or not, white picket fences. I lived in Brooklyn, New York and had never even seen such houses. I’ve recently read about other Black writers who had the same experience when they were children. Some of them like me wrote stories about white suburban families and not portrayals of families like their own. We wrote stories like the ones that we were reading. There were no books for children that reflected the diversity of Black life. JAN: You have written books that have strong historical connections. What about your background and experience influences topics that you choose for your writing projects? LINDA: I took Black studies courses when I was a student at Howard University. I earned advanced degrees and taught Black Studies on the university level. Many believed and hoped that when modern Black Studies programs began in the 1970s the information would be included in mainstream courses from pre-K to graduate school. Regrettably that has not happened. I also write for adults. In my article for the magazine, “Black Women Entrepreneurs” that was published in the magazine, Opportunities for the Minority College Graduate, I included Maggie Lena Walker (1864-1934). This Black woman was the first female bank president of any race in the United States. One of the objectives of my written work is to show the economic and cultural diversity of African Americans. For instance the children in Kenya’s Song have grandparents who embrace their Caribbean culture. 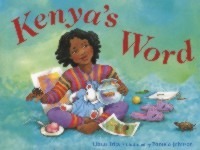 Kenya’s Art and other books in the series show a loving and encouraging middle class two-parent family. Kenya is a strong and creative girl who lives in a multicultural community and whose culturally diverse classmates are kind and supportive of each other. JAN: What writing advice do you have for adults and in particular, beginning writers? LINDA: I’ve been teaching adults how to write for some time now. I was on the faculty of several colleges and at the Institute of Children’s Literature. I gave writing courses in adult education programs and had columns about writing in newspapers and magazines. 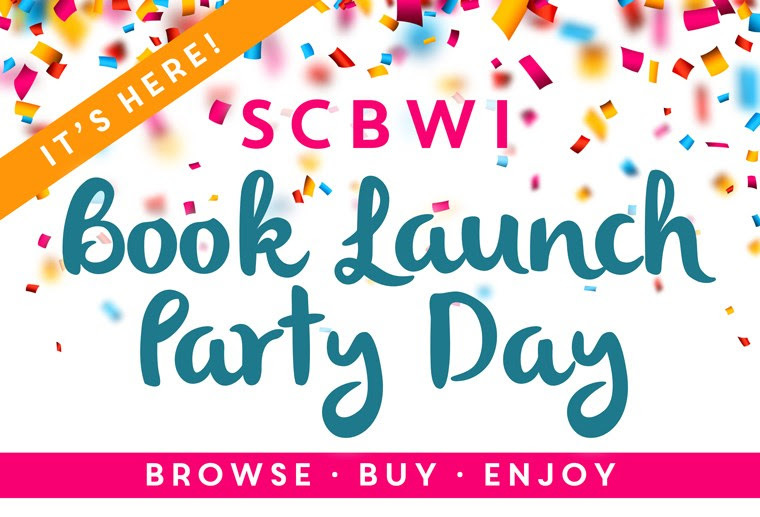 I am invited to speak at regional conferences of the Society for Children Book Writers and Illustrators (SCBWI). Often attendees sign up to get my critique of their work in progress. Many beginning writers want to start off writing a book. I suggest they start by getting published! I suggest that they write and send letters to the editor of their local paper about something they care about. They can write for community newsletters or the newsletters of their church, library, even the one for their job. They may not get paid, but will get good experience in the writing world. I like to remind beginning writers that book authors do the same thing. For example, I work on my books during the week and on weekends I work on articles, poems, and stories. Some are good enough to submit to magazines and newspapers, while others still need work. So the next time I have a few hours I work on them and continue until they are polished. JAN: What can you tell readers about your experiences working with agents? How did you get your first agent? What’s it like to work with and without an agent? LINDA: Well, let me tell you how I found my first agent. I was at a new friend’s party for her five-year old daughter and met a woman who wrote screenplays for a television soap opera. She asked what I had published. Although I hadn’t had a book published yet, my articles and short stories had been. She gave me the name of her agent, Sally Wechsler. Sally looked at my published articles and short stories and then took me on. By that time I’d written articles for the United Methodist Church and reviewed children’s books for them too. The United Presbyterian Church had hired me to write stories for their Sunday schools. I’d also done some articles for neighborhood newspapers. They didn’t pay, but I did get a byline. 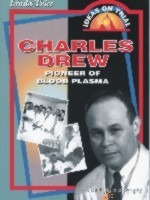 Sally told me that McGraw Hill was doing a series of books for ages 9-12 and needed someone to do a biography of Charles Drew, MD, the Black surgeon who had discovered a way to preserve blood. The American Red Cross asked him to set up America’s first blood banks. He did and they saved lives. Dr. Drew had been a hero to my parents and one of Drew’s daughters had been my classmate at Howard University’s Law School. McGraw Hill was considering two other writers. I was persuasive in my letter to McGraw Hill and got the contract. The book was a success and, with the help of my sister, the first edition quickly sold out. Many of my writer friends have found publishing success without an agent. After Sally Wecksler died I was able to find another agent. But she didn’t work out. And working without an agent won’t prevent writers from success. For example, Highlights Foundation gives workshops for people who want to write and for writers who want to take advanced workshops in writing. I was at one of them when I heard Yolanda Scott, the executive editor of Charlesbridge Publishing speak. I sent my new manuscript, Kenya’s Word to her and she accepted it. I had no agent. Once again my sister helped and the first edition sold out. 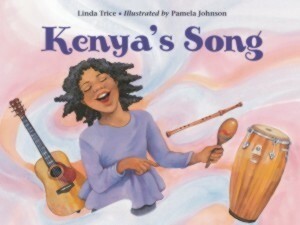 Charlesbridge was so pleased that they offered me a contact for two more books about my character Kenya. I have been invited to speak at schools, community centers, churches, and book fairs. JAN: You have won numerous awards for your writing over the years including the Pewter Plate Award from Highlights for Children for your profile of Harlem Renaissance painter, Jacob Lawrence and you wrote a wonderful book about Charles Drew: Pioneer of Blood Plasma. Which of your many awards has touched you the most? I especially appreciate these two because these are the people who publish magazines that parents and teachers read. Sometimes what touches me most are the heart-felt letters I find in my fan mail. A woman wrote that my article on Black Women Entrepreneurs inspired her because, although she is Black, she had not known about Black women business owners. Writers try to express what is in people’s hearts. We write the words that people often wish they could say. One of my professors once told me, “Linda, you will be a voice of your people.” I hope he was right and that other people will write about the concerns of their communities too. Writers can educate, console and inspire their readers. And isn’t that why we read? Linda Trice was born and raised in the Bedford-Stuyvesant section of Brooklyn, NY. She received an undergraduate degree from Howard University in Washington, DC, and a Master of Fine Arts degree in Creative Writing from Columbia University. She also holds a Ph.D. in Black Studies and is a member of Pi Gamma Mu, the international honor society in social studies. She was a Fellow at the following artist colonies: Millay, Alfred, Hambidge and The Virginia Center for the Creative Arts. ​Before making writing her full-time career, Linda taught lower grades in public schools in New York City, Connecticut and Washington, DC. On the college level, she taught undergraduate, graduate and adult education courses and workshops in writing and Black Studies. 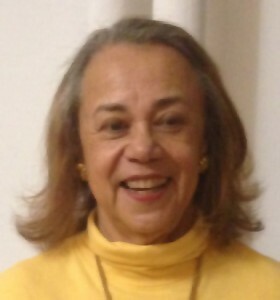 She was a columnist and book reviewer for Comcast, The Hartford Courant, QBR Kids, Black Enterprise, The Bulletin of The Society of Children’s Book Writers and Illustrators and other periodicals. Jan’s story collection, Flight Path & Other Stories published by Evening Street Press. Available online for immediate shipment. Winner of the Roanoke Review Fiction Award, Jan’s stories have been nominated for Best American Short Stories, Pushcart and Pen/O’Henry awards. 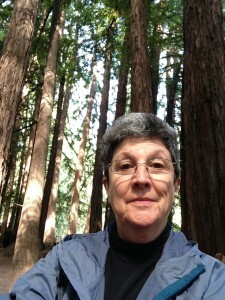 Her fiction has appeared in Evening Street Review, Uncertain Promise: An Anthology of Short Fiction and Creative Nonfiction, Roanoke Review, The Broadkill Review, Third Wednesday, Minimus, Buffalo Spree (97), Folio, The Potomac Review, Musings, and others. Glimmer Train named a story as Honorable Mention for Short Story Awards for New Writers Jan’s stories have been finalists or short- listed for the Broad River Review RASH Award for Fiction, The Phoebe Fiction Contest and So-to-Speak fiction contest. She is working on a new story collection, working title, Life Boat Drills for Children. She has nonfiction publications in Atticus Review, Trajectory, and Pen-in-Hand. She writes a regular blog on her website on the writing life and interviews writers and publishers. This entry was posted by Jan Bowman on Sunday, January 10, 2016.